Dominican Republic – Episode 3: Saving The Best For Last! It took us almost two months bouncing our way along the south coast of the Dominican Republic, but finally we were on our way to a true island paradise. We planned our final stop in the country for Isla Saona – a palm-tree-lined, soft-white-sandy-beached, crystal-clear-water, daytime getaway destination for Dominicans, resort folk, cruise ship passengers and sailors alike. 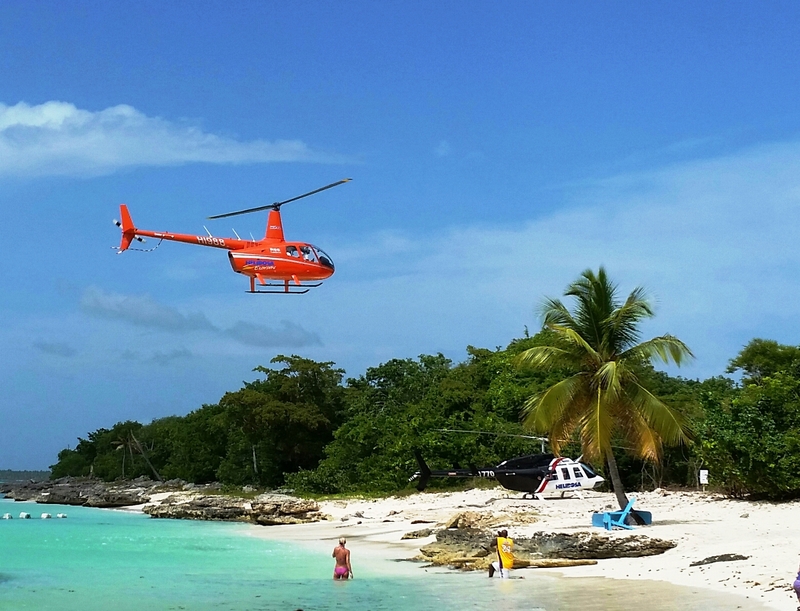 We didn’t know exactly what to expect, but our previous stop, Bayahibe, alerted us to something special waiting. We arrived in Bayahibe after leaving the solitude of the Cumayasa River, excited to be in this quaint little seaside town, full of restaurants, bars, grocery and liquor stores within walking distance, and fuel. 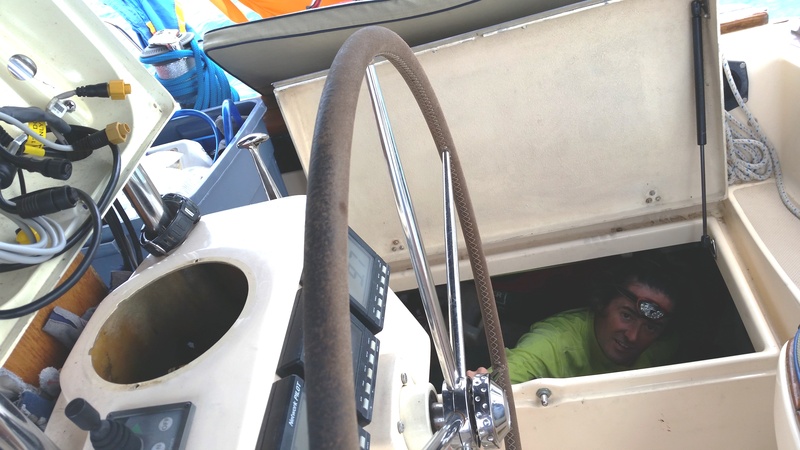 We were surprised by the lack of other boats in the anchorage, as we were surrounded by dozens of empty makeshift moorings – all floating on the water with help from clusters of old plastic bottles. Certainly all of these mooring lines belonged to boats, but where were all of them? We picked a spot on the outskirts, and within seconds of dropping the hook, realized it was going to be a crazy day. Sunday in the DR is fun day. In every town we’d visited it is THE day for the locals to head to the beaches and enjoy a relaxing end to their week. In Boca Chica the most popular water activity was competing for who could get our boat to rock the hardest in our slip using only a jet ski. 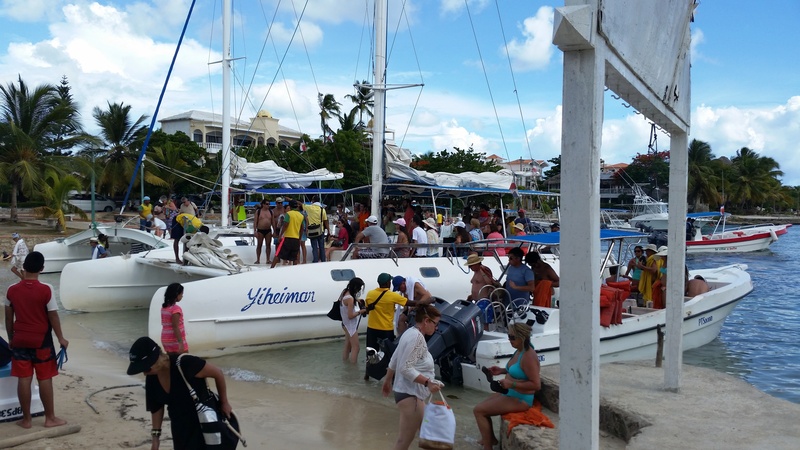 In Bayahibe it was jam-packed speedboats vying for the title of most annoying water toy. These power boats would roar half a boat’s length from us, to the delight of their passengers, who squealed with excitement at every pass. Apparently these fast boats were heralding the arrival of the town fleet. Between four and six pm we lost count of how many charter catamarans and motorboats were zipping around us, all wanting to unload the hordes of people they had shuttled to and from Isla Saona for the day. Before long, every one of those nearby moorings had a huge boat attached, including one whose captain let us know, animatedly, that we were anchored too close for his comfort. We re-anchored, almost running aground on coral in the dimming light (Thanks, friendly boat guy, for the warning! ), and waited for things to settle down; which they did rather quickly. In no time, we were immersed in absolute quiet. We lowered the dinghy, and visited the local comandancia, where we introduced ourselves to the Guardia, and gave them our arrival papers. Just like in the Cumayasa, we encountered the nicest people! The Comandante and other officials in Boca Chica have a lot to learn about professional courtesy. Next, we hit the town! 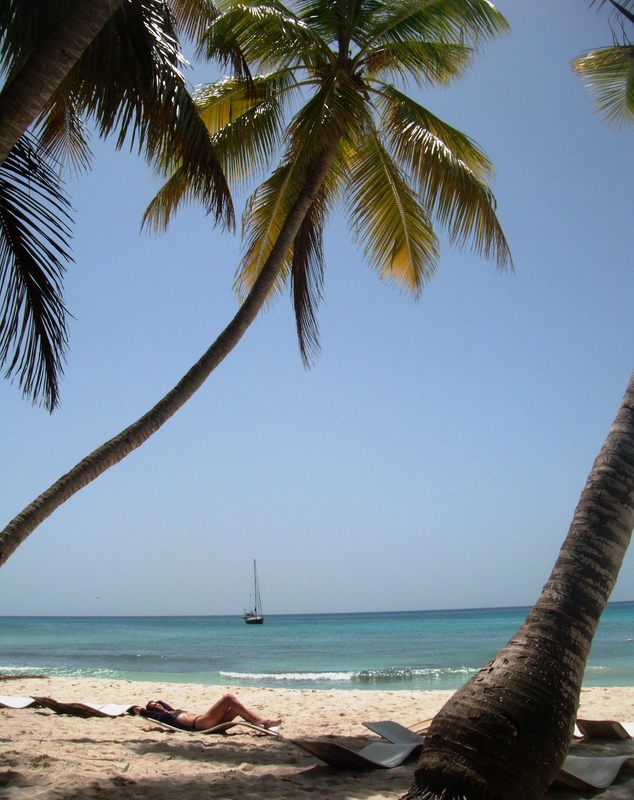 Bayahibe is a sweet little beachside village. We were surprised by how quiet it was. We were expecting every restaurant to be crowded with the aforementioned masses, but they had all gone back to their homes, resorts and cruise ships, leaving us almost alone in this sleepy little town. Along the waterfront are numerous restaurants to choose from, especially if you’re craving Italian food. There was an unexpected European vibe to the whole place, and we found more people with German and Italian accents than Spanish. After filling our bellies with good pasta and wine, we made our way back home. Finding our way to ¡Pura Vida! in the darkness was easy. Out of the many dozens of boats in the anchorage, ours was the only one with an anchor light on. The rest of the week was not at all like that first afternoon. Although the loading of the tour boats commenced each day at nine in the morning, by eleven we were blissfully alone. 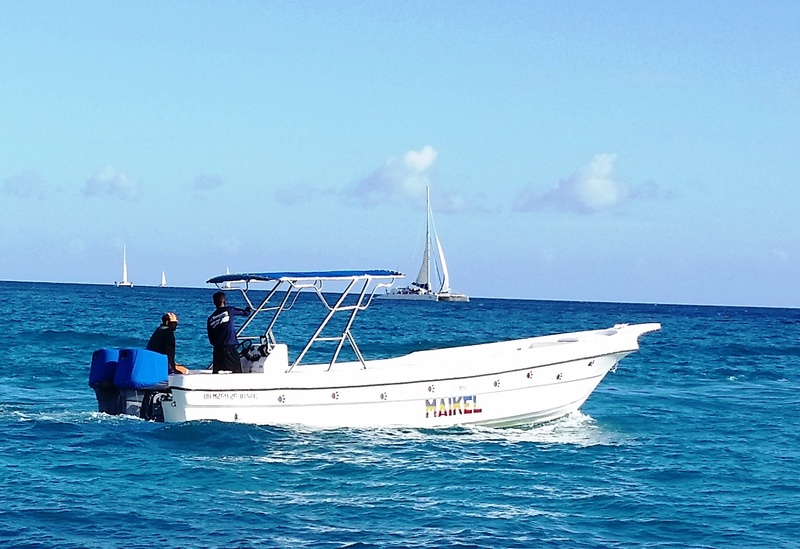 Unfortunately, even without the aid of the powerboats, the bay is quite rolly; so each afternoon we were eager to go to the nearby snorkel site, which was all ours, or go ashore to get our land-legs back. By four each day, however, we were back onboard for “the show”. We realized we were in their world, so we may as well sit back and enjoy it. The tour boats got used to our presence, and started bringing their contents slowly past us each day for photo ops. We got lots of enthusiastic greetings as we sat on the bow with our cocktails, waving to each passing boat. Strangely, we became a local attraction. When we weren’t posing for pictures or cooling off in the clear water, we were working on boat systems. It’s really unbelievable to us, even after all this time living aboard, how often things break down. On our way from the Cumayasa the autopilot went haywire, giving us a “rudder drive error”. What the hell does that mean??! A quick internet search identified it as a problem with our brushes – little chunks of lead that are not in the least “brush-like”. The brushes wear down, leaving lots of lead dust to clog things. 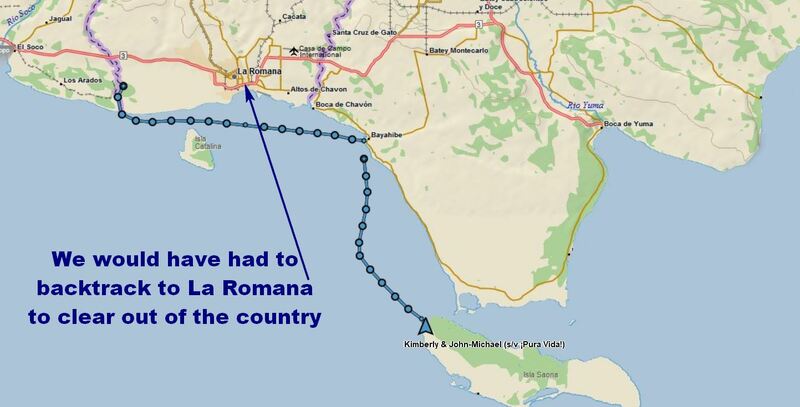 We would soon be traveling fifteen hours across the Mona Passage to Puerto Rico, so the autopilot had to work! That’s a long way to go, hand-steering the whole way in potentially heavy seas. John-Michael crawled into the deep, hot locker where the autopilot resides, and took it apart, cleaning the lead dust as best he could, but realized the brushes needed replacing. We hoped Puerto Rico would be the land of plenty, or at least the land of Amazon Prime deliveries. 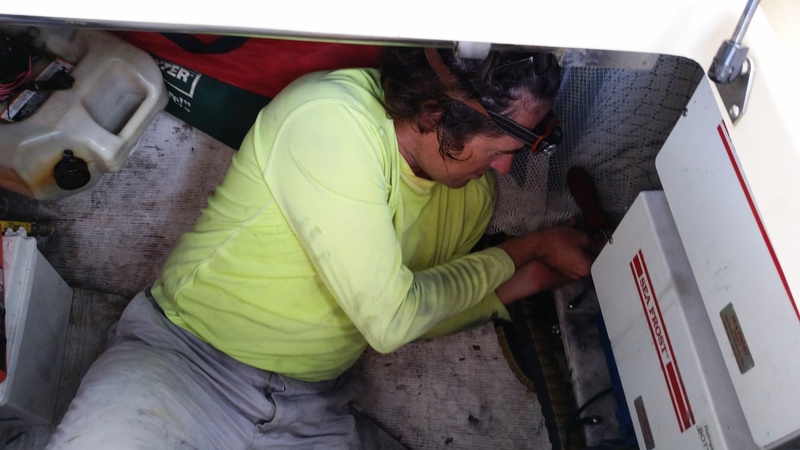 While buried in the locker he also made a temporary adjustment to our generator, which had been giving us fits for months. When the sun and wind aren’t bright and strong enough to bump up our batteries, the generator must rise to the challenge. This battery bank is our source of all power – lights, water, fans, engine starter, and so much more. Because our current batteries are old and dying a slow, pitiful death, we rely on that generator a lot to keep them charged until we can buy new ones in that land of plenty. This fix made the generator more reliable until a proper repair could be made. I sure hope Puerto Rico delivers all it promises in my dreams. Before John-Michael could be freed from his dungeon, more stuff broke down. This time, while I sat in the cockpit, passing tools down like a sweaty O.R. nurse to a greasy doctor, I noticed all of our instruments went blank. The wind anemometer, depth gauge, and autopilot control unit were dead. This, luckily, was an easy remedy, albeit one that required the dismantling of the entire steering console. Some connection wasn’t actually connecting. Once the two pieces were happily sharing power again, everything blinked back to life. What would I do without Mr. Fixit? 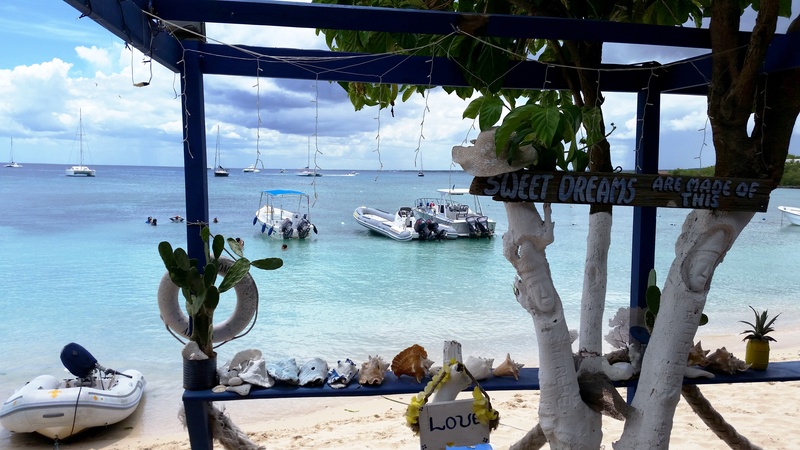 As much as we enjoyed Bayahibe for our week-long stay, and would recommend it as a cruiser’s stop, we were ready to see what all the fuss was about on Isla Saona. We visited the friendly Comandante once more to secure our departure papers, gladly giving him a bottle of rum as a thank you for his friendly service. Two hours later, we were lounging on a snow-white beach with our own glass of rum. Isla Saona is a very, very popular place, but it’s so large, with beaches in several locations, that it didn’t seem crowded. If you go by tour boat, lunch, rum drinks and beer are included. We scored a couple of drinks, but the bartender wasn’t set up to take our cash as payment. He was, however, more than happy to accept a tip, which we eagerly offered him for not denying us imposters a cool beverage. We cleared in with yet another friendly group of officials who didn’t even bother taking our papers. 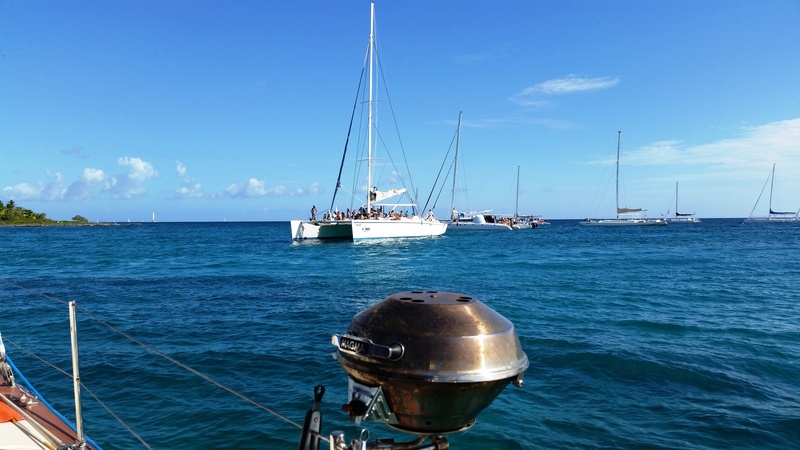 The same tourist boats that greeted us in the afternoons in Bayahibe now waved their goodbyes as they left Isla Saona. By four in the afternoon we were alone in this paradisiacal anchorage. We were content to stick around, and Mother Nature ensured we would have little other choice. 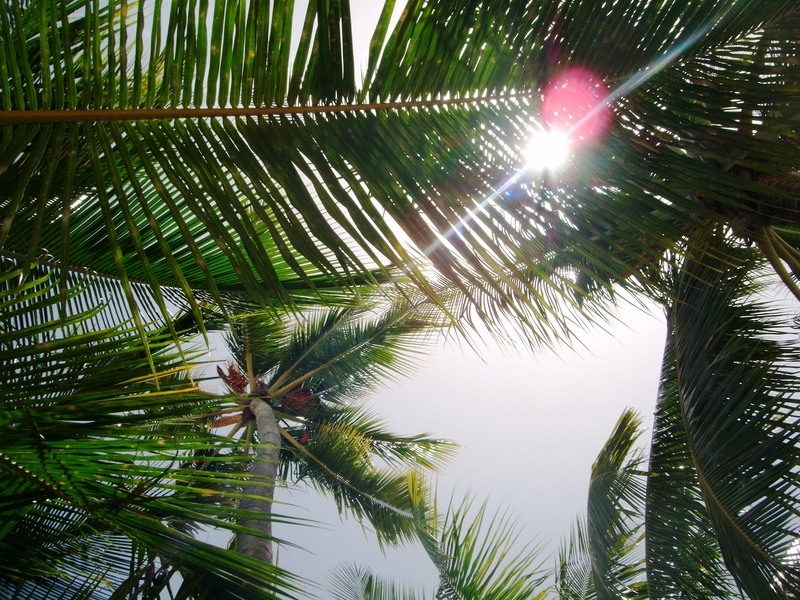 The next day, after a couple of massages under the palms, and a little souvenir shopping, we started making preparations for the potential development of a major storm. 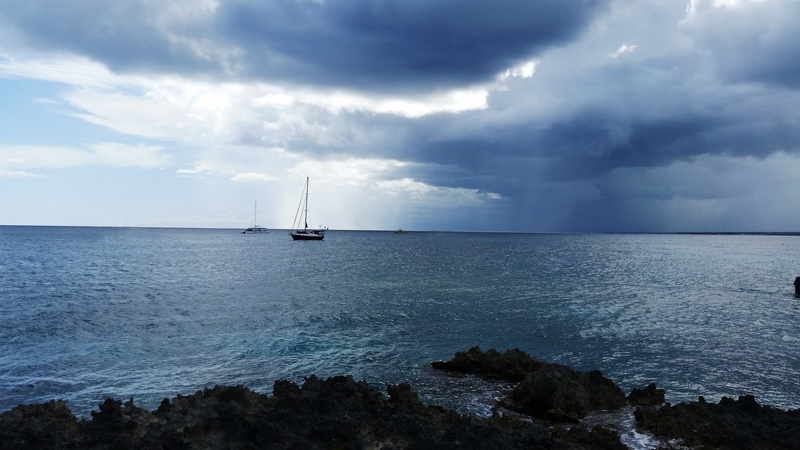 Hoping it would be no more than a few nasty squalls, we moved to a spot three miles north called Las Palmillas, right off the tip of the mainland. This gave us better protection against the predicted northeast winds. We knew we could be back in the Cumayasa River in about four hours if need be, but we were hoping this first tempest of the 2016 season wouldn’t require it. We knew what we were signing up for by remaining in the hurricane zone, but it was only July, and we weren’t eager to start all the work involved in prepping a boat for a major storm. 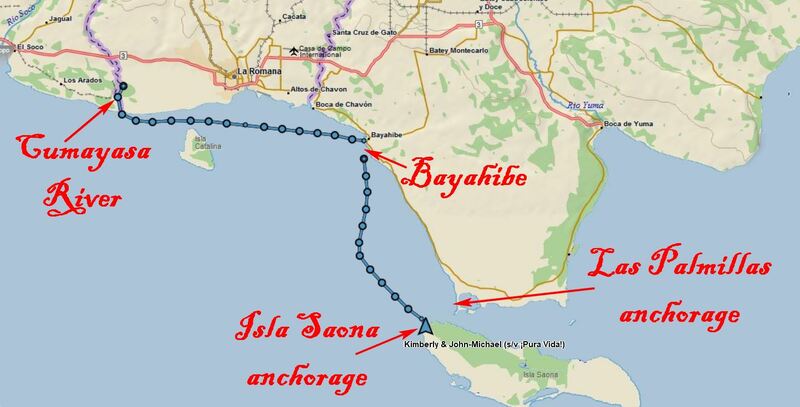 This anchorage, also, cleared out of tour boats later in the day. What was comforting, but at the same time a little scary, was some of them returned that evening without passengers, to hunker down. It reassured us that locals were also using this anchorage for storm protection, but worried us that they felt a need to do so. It was a sign this storm could be big. Still, our trusted weather gurus and radar were telling us it would be nothing we couldn’t ride out when it barreled through overnight. (Why do they always come at night??) We went to sleep with knots in our stomachs and woke up to sunny skies. The storm passed by us. What a relief that was! We, arrogantly, thought we’d dodged a big one. After a couple of peaceful days at this anchorage we were ready to return to Isla Saona to be closer to the comandancia so we could get our departure papers. John-Michael’s very own boat, spelled just like his mama would have liked! In a demonstration of the worst timing possible, we left Las Palmillas as a huge dark cloud was approaching. We’d seen many of these in the previous few days, and all of them offered nothing but shade. This one did not seem any more threatening. Evidently, the local fleet thought so too, as it was starting its way back to Bayahibe to drop off tourists. We had three miles to go, and in twenty knot winds we gladly hoisted our headsail for a little push – and because we knew our boat was being photographed as the tour boats sailed by us. With absolutely no warning the air got very cold, and within seconds, the wind climbed from twenty knots to sixty! We were all slammed sideways as the weather caught us off guard. We had never been in conditions like that before, but Pura Vida just pushed right on through. The torrential rain and wind caused a near complete whiteout, and our radar could not penetrate the blanket of water to identify the flotilla heading our way that was so easy to see just seconds prior. With our eyes stinging from the deluge, we craned our heads around the dodger (plastic windshield) to try to spot the tour catamarans as they emerged like gray ghosts from the rain, and had to shout to make sure we were seen. They only materialized out of the gloom when we were within sixty feet, way too close for comfort in the raging sea conditions. All around us sails were flogging helplessly, and boats were bouncing like broncos on the heavy seas. Petrified tourists were being ushered below decks with lifejackets on, but every captain was standing tall and waving as they went by, as if to say “We’re okay!”, and waiting for us to signal our safe condition back to them. We turned on the engine and furled our sail as quickly as we could, but we could tell already that damage had been done. It took us thirty minutes to go those three miles, and by the time we anchored the sun was shining on the shredded edge of our sail. Closer inspection revealed it was mostly the sacrificial cover, which protects the edge from UV rays that was damaged, but we knew this sail would be out of commission until we could do repairs. I can’t say it was an enjoyable experience, but we were glad when reflecting on it later that both of us remained very calm, and got the boat under control. 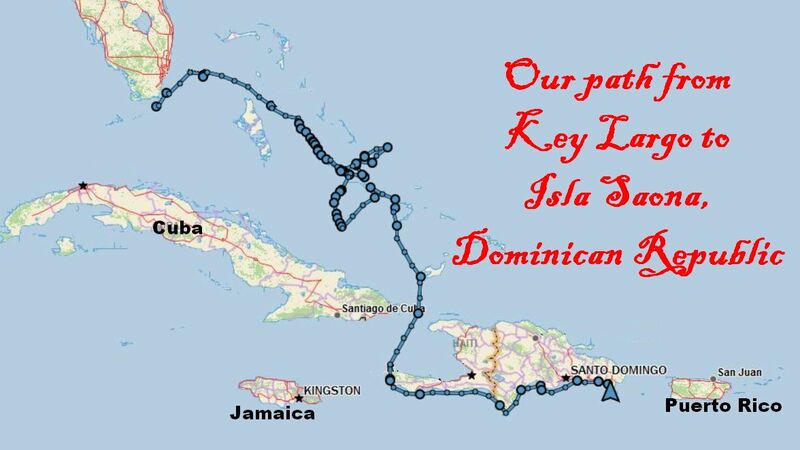 After reaching out on our SSB radio to the favorite cruising weather guru of all, Chris Parker, we learned that the following day would offer the best chance in the near future for a comfortable motor crossing of the Mona Passage to Puerto Rico. Sailing, we knew, would be out of the question, as the prevailing winds this time of year come straight out of the east – the direction we’d be heading – and boats cannot sail into the wind. Tacking back and forth was not a good option because it would nearly double our time at sea and greatly increase our chances of hitting rough weather. Motoring had been our mode of transportation since rounding the southwest corner of Haiti two months earlier. A ninety-mile “comfortable motor” was the best we could hope for, and we were taking it! Now, here’s where things get sketchy. To leave any port in the Dominican Republic you must get written clearance, a despacho, from the comandancia office. That clearance must be given to the next comandancia upon arrival or you may not be allowed to stay. All ports can do this, but only a select few can clear you completely out of the country. This international clearance requires a lengthy inspection, including a canine search of your boat. 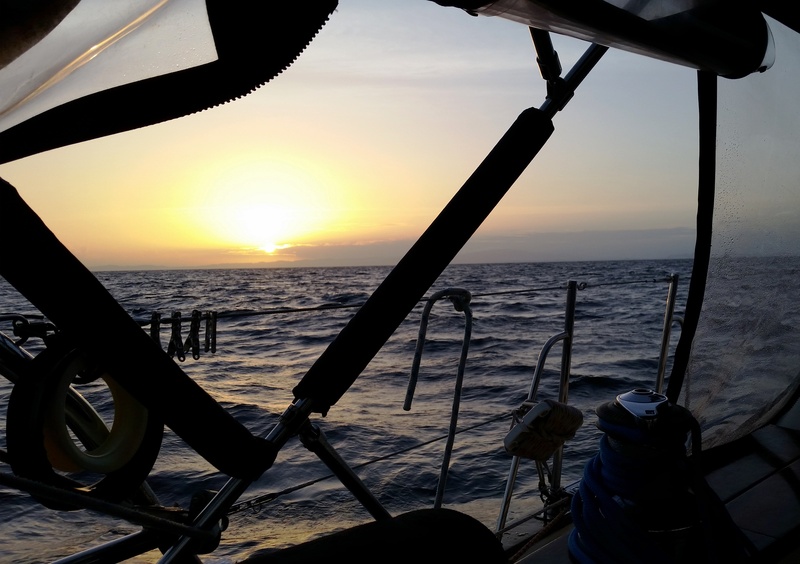 The nearest port for international clearance was twenty miles back, which meant we’d have to backtrack, then depart from there the next day, adding all those miles to an already long passage, and risk missing our narrow weather window. Well, it turns out that as U.S. citizens on a U.S. registered boat we do not need clearance to enter Puerto Rico – we can just show up and call in our arrival in all U.S. ports and territories. Still, to cover our bases, we got our despacho from the local comandancia declaring our destination as the next DR port, Punta Cana. In case something went wrong in the Mona Passage, and we had to turn back, our local departure papers would be in order, and you are never faulted if you have to return for engine trouble, weather, or a medical issue. To cover our bases even more, we gave the official our last bottle of delicious Barceló rum. He bid us “buen viaje” and we were on our way to the United Sates as the sun was setting behind us! Just started following your blog, after I saw a hilarious picture of you 2 on Facebook, commenting about how you used to live respectable lives! Excellent writing, and the technical details about your upgrades are wonderful. 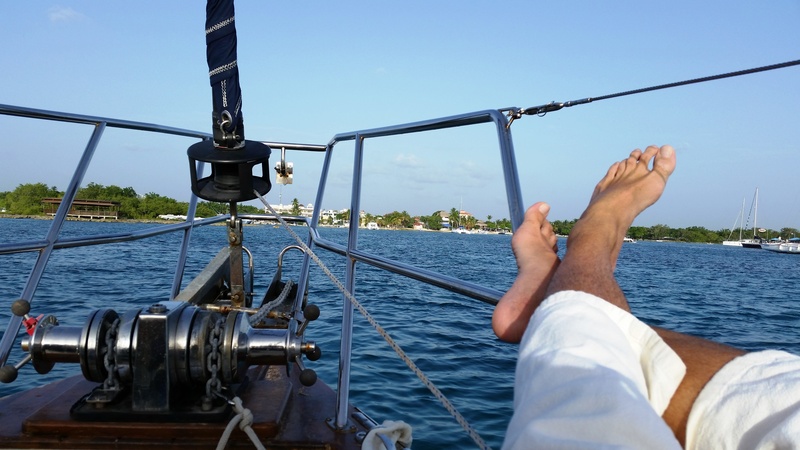 So far my wife & I are just bareboat charterers, but one day maybe that’ll change. Thanks for what you do!! Showing there’s another way to be! Hope the hurricanes haven’t hurt you too much? Hopefully you had time to get out of the way. Our recent travels in the BVIs were only about 2 months ago – and from pictures I’ve seen we’d hardly recognize the place now. Really bad. Thanks so much, Laine! Glad you’re enjoying the blog. 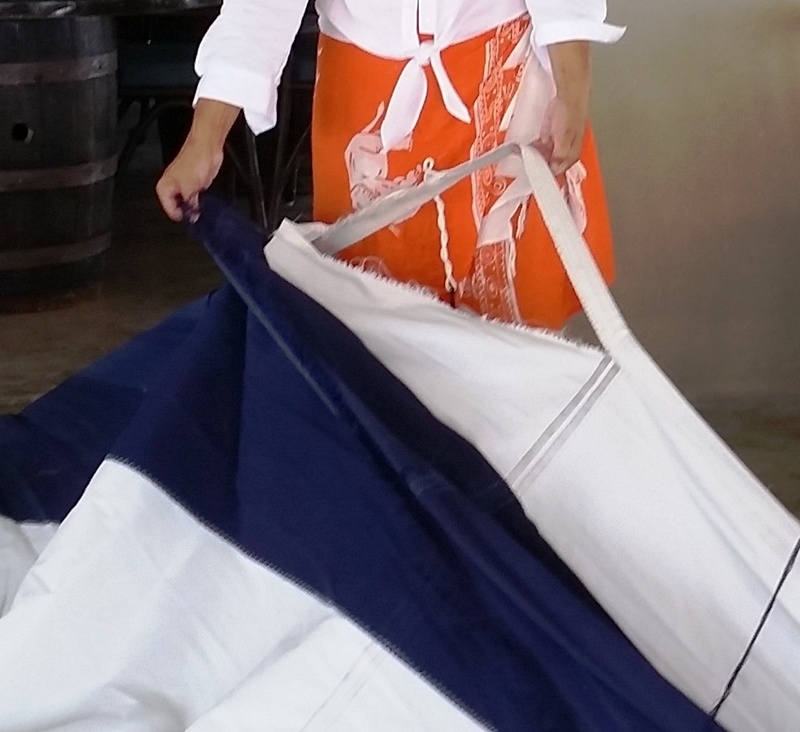 We started as charterers in the BVI ourselves and that’s what solidified our dream. Fortunately, we got to Grenada in July and have missed all the bad weather this season except for TS Don, which ended up being a non-event. We’re hearing that despite the devastation, many places in the BVI are re-opening already. We plan to be there by January to help in any way we can. Hope to see you out here some day!